Safe and organic termite removal treatments. Locally treat area(s) using the best method for the given situation. Most common and effective local treatments are foam treatments, used for drywall and wall voids, and drill treat, used for treating visible timbers; such as patios, trims, eaves, jambs, etc. Unlike Drywood termites, Subterranean termites live in the soil under the infested structure. The best method for elimination is to treat the soil where they live. Sierra uses Termidor, the #1 product for treating, elimination, and preventing Subterranean termites. 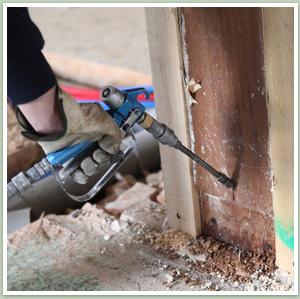 We also provide termite-maintenance programs and preventative treatments.